The School of Engineering’s iron pin. Most universities are steeped in tradition and that’s certainly the case with UBC Okanagan’s School of Engineering (SoE). But this September, the SoE is embracing a new tradition. While the Iron Ring Ceremony, a presentation made as Canadian students graduate as engineers will continue, this year all faculty, students, and staff will be presented with an iron pin. Engineers adhere to a strong code of ethics for both personal and professional decisions throughout their lives, explains Spiro Yannacopoulos, Associate Dean of the School of Engineering. The newly adopted presentation of the iron pin is intended to create early awareness of the Engineering Code of Ethics, and let the students know there is a certain level of professionalism expected from the moment they begin their engineering degree on campus. “This new process will serve as a reminder to all students, starting in Year One that professionalism is expected from the start and the entire time they are studying to be an engineer — not on completion of a degree,” says Yannacopoulos. All graduating engineers take an oath agreeing to an Engineering Code of Ethics, says Yannacopoulos. With the oath, they accept an iron ring which they wear on the little finger of their working hand until retirement. 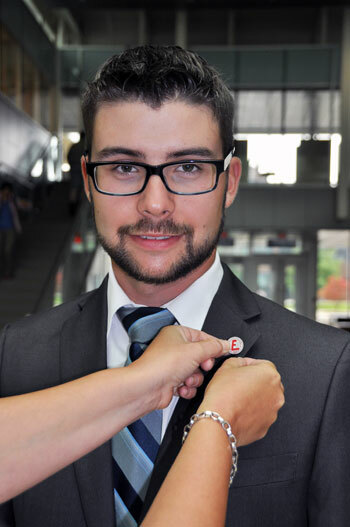 Fourth-year electrical engineering student Connor Badowich gets pinned as the start of the new academic year begins at UBC Okanagan’s School of Engineering. Badowich, student president of the Engineering Society at UBC, credits UBC’s faculty, saying the Association of Professional Engineers and Geoscientists of British Columbia — the licencing body for engineers in BC — code of conduct is incorporated into lessons from the beginning. 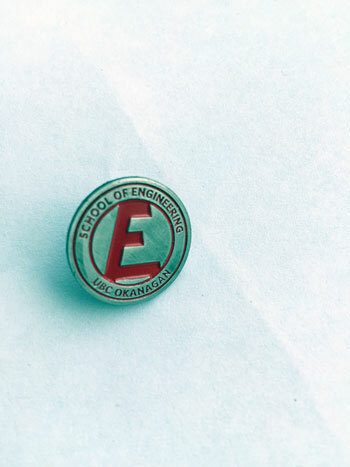 Because this is an introductory year for the iron pin, Yannacopoulos says all School of Engineering students, in addition to faculty and staff, will be asked to accept a Code of Ethics at formal ceremonies this fall and will be given an iron pin as a reminder of their commitment. In future years, only first-year students will be part of the official ceremony.